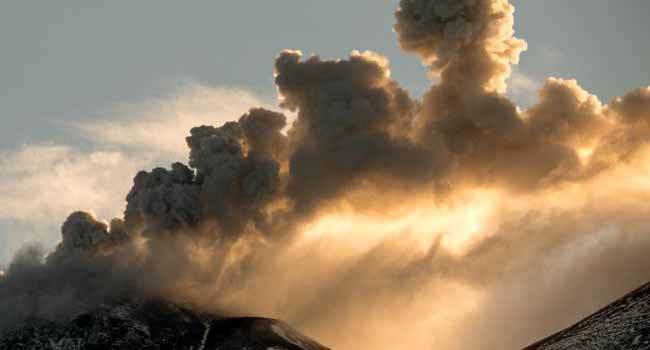 A volcano erupted in southern Japan on Thursday, spewing steam and ash hundreds of metres into the air, as authorities warned locals not to approach the mountain. “It was confirmed that rocks fell because of the eruption” near Mount Io, part of the Mount Kirishima group of volcanoes, said Makoto Saito, an official of the meteorological agency. “There is a possibility that (the volcano) will become more active,” he told reporters, warning people to stay away from the volcano as major ash deposits spread from the crater. Footage captured by the Japan Meteorological Agency and local media showed thick white and grey smoke rising from several areas of the mountain. There were no immediate reports of injuries, Chief Cabinet Secretary Yoshihide Suga said, adding that the government was “taking all possible measures” to prevent damage and casualties. The eruption occurred a few kilometres (miles) away from Shinmoedake, which featured in the 1967 James Bond film “You Only Live Twice” and erupted in March. Japan, with scores of active volcanoes, sits on the so-called Pacific “Ring of Fire” where a large proportion of the world’s earthquakes and volcanic eruptions are recorded. In January, a Japanese soldier was killed and several other people injured after an eruption near a popular ski resort in northwest of Tokyo.